Cut the empty plastic bottle in half width-ways, and keep the bottom part. Place a bottle of vodka inside the plastic bottle, fill it with water, and add slices of lemon and mint leaves. Place in the freezer for 3 hours, then cut one side of the plastic and unmold it. Place the frozen bottle in the middle of the fishbowl. 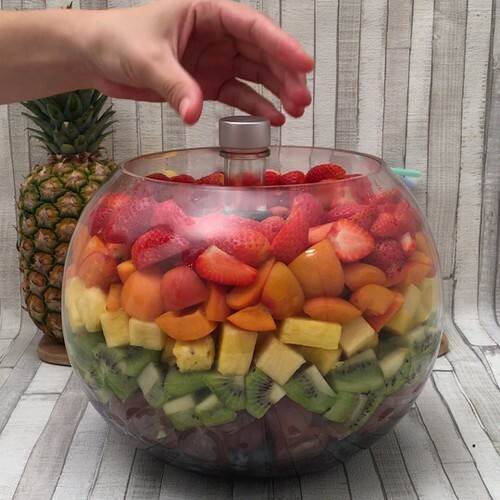 Add a layer of blueberries, then grape halves, then kiwi, pineapple, apricots and finally strawberries. Remove the vodka bottle from the ice, and fill the space with the vodka. Then fill 3/4 of the fishbowl with the wine and lemonade. Serve fresh immediately.